I’m not ashamed to say that reading One Second After by William Forstchen scared the living daylights out of me. For weeks, I didn’t want to travel more than 15 or 20 miles from home. The novel details life in a small North Carolina town following an EMP, an electromagnetic pulse. An EMP can be caused by the detonation of a large bomb, nuclear or otherwise, in the atmosphere, miles above land. Its pulse wave can easily cover a continent and destroy electronic components in computers, engines, power plants, and solar panels alike. An event like this has never happened on a large scale, and there are differing opinions as to the exact consequences, but one thing is certain: In a matter of moments, life as we know it would be gone forever. Our closest star, the sun, could also do extensive damage in the form of a Coronal Mass Ejection (CME). The results would be similar. Some might describe a post-EMP world as going back to the nineteenth century, but I think in some ways it would be far worse. We no longer have the tools, skills, knowledge, and, in some cases, raw materials to make the most basic tools for survival. How many blacksmiths do you know? Do you happen to own a pair of oxen and a wagon for transportation? You might know how to sew, but can you create cloth from raw cotton or sheep’s wool? The moment of an EMP burst freezes time. The food, medications, supplies, and tools in our homes may be the only ones we have for a long time. If you have 9 bottles of Advil, that’s all you may ever have. There are so many unknowns when it comes to EMP/CME, but one way to prepare is to build one or more containers to shield important items from the effects of 50,000 volts of power. These containers are called Faraday cages and were first invented by Michael Faraday, a top-notch scientist of the mid-1800’s. Fortunately for us, they’re pretty simple to make. My friend Rob Hanus of The Preparedness Podcast and author of Surviving EMP, has spent a good deal of time researching the facts and myths of EMP/CME, and here are his simple instructions for making your own Faraday cage. The hardest part about protecting your equipment is simply doing it. A few rolls of heavy duty aluminum foil, some cardboard boxes and a galvanized steel trash can are enough to create your own Faraday cage and protect your electronics from EMP. The simplest and cheapest way to build your own Faraday container is to use heavy duty aluminum foil. By completely wrapping an item in several layers of foil, you can protect that item from damaging effects of EMP. Keep in mind that every side of the item needs to have a minimum of three layers, so by the time you’re done wrapping it in the foil, some sides may have more than three layers. This is fine, so long as you have no less than three layers of HD aluminum foil between any part of the item and the open air. By itself, these three or four layers of foil are probably enough to protect your electronic gear, but when dealing with a TEOTWAWKI* scenario, there are no replacements, nor second chances, so it pays to do it right the first time. Simply adding more than four layers of foil to the device is probably overkill and may not add any more protection than the initial three or four layers. However, you can increase the effectiveness of your Faraday protection by layering, or nesting them. For example, place your foil wrapped device into a shoe box or other cardboard box that is wrapped in foil, then place that box inside a galvanized steel trash can with a tight-fitting lid. For convenience, you may want to use several smaller steel cans with lids rather than just one large one. With your devices protected by three layers like this, they’re likely to survive even an enhanced EMP attack with a stronger electromagnetic pulse. Heavy duty aluminum foil. You’re going to be using a lot of this, so be on the lookout for coupons! Either plastic wrap (Saran or something similar) or plastic bags for each electronic item you want to shield. Pieces of cloth that will be used to wrap items. This is a good way to re-purpose old t-shirts, jeans, and clothes the kids have outgrown. Small, essential items that contain an electronic component, such as a clock radio, a hand-crank weather radio, walkie-talkies, ebook/Kindle, mp3 player, etc. Make sure these aren’t things you’ll be wanting or needing in the near future. If you don’t already have duplicates, make a list of what you want to be stored in your Faraday container and then look for inexpensive duplicates at garage and estate sales. The procedure is very simple. First, wrap an item in cloth. This will add a layer that will isolate the item from the foil and will also help to keep any sharp edges or corners of the item from puncturing the aluminum foil. Next, wrap the object with plastic wrap or place in a plastic bag and then wrap with at least 3 layers of foil. Use your hands to gently mold the foil each time, making sure there are no holes or rips in the foil. 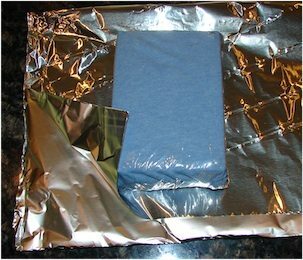 Every bit of the item’s surface should be covered with at least 3 layers of foil. Place your wrapped items in the cardboard box and then wrap the entire box with two layers of foil. Layering for EMP/CME is just as important as layering for winter weather! Be sure that no foil used to wrap the outside of the box touches any of the foil within the box. When your box is wrapped and finished, store it off the ground. If you want to store large items or have numerous items to store, completely line a galvanized steel trash with cardboard. Make sure there are no gaps. The foil wrapped items cannot touch the metal of the trash can. Make sure the lid of the can fits tightly, and you’re good to go. Look for more information about EMP and Faraday containers right here on this blog. Kindle or other e-readers — Load that baby up with hundreds of books! Want to enjoy some more EMP fiction? Try these books recommended by my readers! Lights Out by Ted Koppel — Read my review. Article originally published October 9, 2012. I actually built the one pictured a few months ago, now to just make sure to put ALL the stuff in it…I’m thinking an mp3 player with all kinds of music, alt powered radio, maybe an old notebook w thumb drives holding all our “GNG” info. (I already have this stuff on a drive, just need a duplicate in the can) and another with pics. In the event of an EMP-type scenario, it’s possible that I would be separated (long-term or permanently) from my grown children (sniffle) so I’d want to be able to pull up pics of them and look at them at any moment! 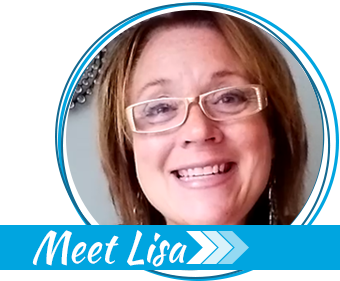 I’m sorry Lisa (not the survival-mom-lisa, the person posting above), but a Faraday cage, an old laptop, etc. are not necessary and probably a poor choice for keeping pictures of your loved ones. Print them out on good photo paper and treated well they will last longer than you do. They won’t require power and will not give away your location at night. I can read the same books I had as a kid 30 years ago off my shelf, go to a collectable book store and pick up a 300 year old volume to take home, or go to a museum and look at a 2000 year old legible scroll. I try to show a website to my students and the video/image format being more than 5 years old is out of date and “broken”. In my limited experience digital formats and storage media have extremely short half-lives and are relatively unreliable. If you are worried about EMPs save hardcopies. I think you both have the right idea. Books, print outs and physical photos are not susceptible to being destroyed by EMP, so having printed copies of important information is a must. However, don’t underestimate the power of having thousands of books and gigabytes of information at your fingertips in digital format. Computers (and smartphones, tablets, music players, etc.) are popular because they can easily process massive amounts of information, and provide entertainment. I would much rather do a search through my digital notes and pull up dozens of articles, books, and notes about a topic, with the ability to quickly drill down to what I’m looking for, than to waste potentially hours sifting through one book, then another. I remember doing this type of research in the library as a student and it was painstakingly slow. Just think what it would take to print out the gigabytes of preparedness and survival information that I’ve been compiling for well over a decade, and the more than 50,000 digital pictures of my family life. Additionally, having access to thousands of novels and short stories would be wonderful after a hard day’s work. Not to mention the joy of listening to music, podcasts and audiobooks while you do chores (those that don’t require you to be alert). True, you don’t absolutely need computers or digital information to survive. But, my goal isn’t just to survive, I want to live and thrive as conveniently and as comfortably as possible. Books are great, but are very difficult to transport if you’re trying to keep a lot of references. Consider putting something like a Nook Simple Touch in the faraday cage. They can be rooted to turn them into a regular Android pad and can have thousands of books and other media stored on flash drives. Another tip – ground the faraday cage. If you can solder, do this to make a good connection between all the foil layers, then solder a wire to them and plug the wire into a ground connection. This helps drain off the current that can damage electronics and makes it even more likely the things in your safe box will stay safe. If you can’t solder, don’t worry. Buy alligator clips at a store like Frys Electronics or Radio Shack and use that to connect the foil to a ground. And by ground, I mean anything grounded to the earth. Your house pipes and electric systems are generally grounded if your home isn’t really old, and if that won’t work, get a simple grounding rod for $15 or less. See my comment below about the grounding. 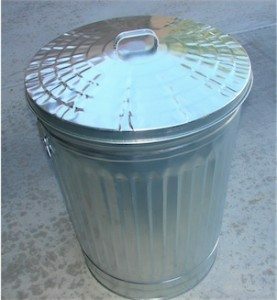 I have a galvinized trash can,,faraday cage ,,should it be sitting on the concreit or should I raise it off the ground? microwave ovens are super faraday cages, put your cell phone or a tablet in it and close the door and look at it the signal will be gone. if you are trying to save a laptop and a few cellphones and even a pad or two most microwaves will fit a lot of devices. you can remove the cover of the microwave oven and still no signal leakage. because the microwave oven has two casings or shells, the outer cover and the inner shell, i recommend those who are capable to take a microwave oven apart and remove the magnetron and look at the double caging. anyhow everyone who owns a microwave oven has a faraday cage on steroids, if you have things larger than will fit in a microwave oven then lisa’s methods might work better. I’d cut off the cord to be sure the stuff doesn’t accidentally get microwaved! Microwaves only protect to certain frequency levels. Take the time to wrap your items, THEN use the microwave as a container. Make the investment, if you can, of several emp faraday bags if you really feel the need to save your electronics. Remember if you have electronic solar operated equipment make sure that the room is set up in is lined as a faraday cage. Consider the expense as paying yourself for insurance. How are you going to re-charge the batteries in your electronics? Remember, the grid will be down for maybe forever? 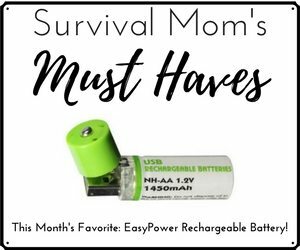 No electric power means no battery power after your batteries or rechargeable batteries are dead. No music, no internet, no lights, no refrigeration, no transportation. If it isn’t on paper, it is gone after an EMP event. Technology is gone back to the 1800’s unless you have a crank powered radio, and your prep info on paper. If the power grid goes down, it may be five to ten years before it is restored to half its original capacity. The Nations population would be reduced by 80% by starvation, disease, and those who take maintenance meds for diabetes, heart conditions, and dialysis patients will be the first to die. No antibiotics will be available for those simple cuts that will kill by blood poisoning, unless u can sterilize with alcohol and keep it clean. Fred, invest in a solar battery charger and recharging won’t be an issue. This blog contains numerous articles about the possible effects of EMP. Do you have to wrap it in foil if you have a steel trash can with cardboard? Yes. The key is layers of protection. The trash can on its own isn’t enough. Right. The idea is to layer your gear into 2 or 3 levels of shielding. The more shielding you have, the less energy that can reach your device. Think of the EMP as being like sound. Let’s say your teenage offspring is loudly playing music in their room. When you close the door to their room, the sound is greatly diminished. This is the first layer of shielding. If you walk outside, and close the front door after you, the sound diminished even more. This is the second layer. Now, if your son or daughter is blessed with a really good stereo system and you can still hear it, when you walk into your next-door neighbor’s house, finally, you can’t hear the music. You now have enough shielding between you and the stereo. Same exact concept we’re going for with Faraday shielding. What about ventilation – a computer, microwave or many another electronic device will need ventilation holes. How do you do that, especially when these devices also need air-intakes? I can’t think of any reason why ventilation is necessary. To do so would completely defeat your purpose of protecting the electronics, since the openings would easily allow the electromagnetic surge into the container. microwaves have 3 enclosures the inner one you put your food in the second layer is where the magnetron mounts to, so all the heat sinks and power supplies are in the second layer and the 3rd layer is the outer cover, the magnetron is made so all the heat is radiated from its back side from the aluminum heat sinks where the air from the cooling fan flows. i recommend those who really want to learn about shielding get a used microwave oven and take it apart and see how it is all laid out, then you will clearly understand how to cool something and shield in it’s radiation.. oh and for the moderator and everyone, enjoy these photos, i think you will find them very very interesting. You’re NOT going to RUN these devices in a Faraday cage, so you don’t need to worry about heat. Let’s understand that an EMP is not an ongoing occurrence. It happens quite fast, burns out the electronics, then dissipates. At that point you can remove all of the Faraday protection and fire up your items. There is no lingering EMP effect. Yes, Dr. Arthur T. Bradley, who has done extensive research on EMP, has said a microwave will not protect electronics and isn’t an effective Faraday container. Its not like sound, if you put metal foil in a microwave it gets electricity induced in it. We proved long ago in physics class that if you completely wrap something in metal no electromagnetic signal can get in or out. But if it is inducing charge there is always the chance that the current induced will actually melt the metal if it is too thin(this is what happens to your foil in the microwave). So its the conductivity of the layer which depends on type of metal and thickness ultimately. It should be noted, that although an EMP is not an ongoing phenomenon, if something such as a nuclear attack happens, there may be REPEATED detonations near you, and as such, you may have REPEATING EMP’s. Should TSHTF, do not disassemble Faraday cages until you are SURE that no further chance of EMP sources may occur. what about batteries? I’m confused as if these would need to be in a faraday cage or not. I’d like to know about batteries too (AA through D) – and what about generators? Are there electronics in the generators that might get zapped?? To be honest, we really don’t know whether batteries will be effected by EMP. They weren’t effected in tests in the ’60s, but who knows? The info available is extremely limited. Be on the safe side and store some in your Faraday container. Generators: As far as I know, all modern generators have electronics in them. These components will most likely be destroyed. If your plan is to use the generator after an EMP event, I would suggest buying spare parts now and storing them in your shielded container. Exactly WHAT spare parts? To someone who has little mechanical education, we have no idea which parts will be zapped, and therefore, no ideas what spare parts to buy to replace. Thanks for the info, though! Carol, if you have a generator with a push button start, then you would need a spark plug, solid state ignition, and starter. If the generator has a pull start only or a push button start with a back up pull start, then you would only need a spark plug and solid state ignition. To find out how to get those parts, there is usually a data plate located on the equipment that gives you a string of numbers indicating the the model and other data. Write those numbers down (or take a picture) and take them to a local repair shop and tell them what you need for your generator set up. Or, if you are really handy, you can google the string of numbers and find online schematics and part vendors. Remember though, if you do not know what these parts are or how to get them, you would need a repair manual or someone with mechanical knowledge to replace them after the emp event. An EMP will fry electronics because, electronics are very sensitive to high voltage transients, and by electronics I mean the minute transistors inside IC’s (not the wires or conductors in the circuit. What happens is you get a big EMP, and those wires and conductors act like radio antennas and induce uncontrolled voltages and currents in the transistors. If the voltage exceeds the breakdown voltage of the substrate (usually only a few volts) the silicon will break down (fry) this will carbonise the substrate, and the transistor because a carbon resistor instead. Batteries will not get due to EMP unless its a fancy hybrid electronics system battery. If there’s protection circuit, it can be damaged. One Second After also scared the daylights out of me, but I haven’t known how to do anything about it. Please forgive my ignorance, but when would you put the items in the Faraday cage? Do you keep them in there whenever not in use? If you get warning of a bad event? Tammy L., the items you store in a Faraday cage have to be there indefinitely. You can’t take them out and use them, because a catastrophe EMP event would most likely occur without warning. So, anything you store in your cage will need to be extras of what you already use on a daily basis. For example, emergency radio equipment for communication and obtaining information would be great items to store in your Faraday cage. Remember that you need a non-electric way of charging the items that you store, since an EMP or grid failure situation would mean power outage for an indefinite amount of time. Look into a hand crank charger and/or radio combination. If possible, set up two mostly duplicate Faraday cages. Then open only ONE at a time; e.g. to charge up batteries. Better, store some non-rechargeable batteries in your Faraday box and don’t open it until the expiration date of those batteries. Check the shelf life of the batteries. For non-rechargeable batteries this is usually 5 to 10 years, while for rechargeable batteries it will usually be days to months. Set for yourself a reminder/appointment/what-have-you on your smart-phone/pad/Google Calendar to remind you when to replace your batteries. Use two separate Faraday boxes. One for your devices and one for the batteries. Only open the battery box when the shelf life is about gone. You can put those batteries to use when you take them out of the box. The non-rechargeable batteries in your Faraday box will not provide power forever post-SHTF, so you will want to have some rechargeable batteries in your Faraday box along with a hand crank generator and/or a solar panel with an inverter to make 120 volts AC from the DC output of the solar panel. With one or two solar panels, all of your small devices that plug into the wall outlet can be used, one or two at a time, to listen to the radio, or charge batteries for any device. Keep in mind that current solar panels are large. The ones used on the roof of houses can produce 200 to 400 watts, but they are about 3 feet by 6 feet — not exactly portable. A “portable” panel about 2 feet by 2 feet will generate about 50 watts at 12V DC. Do you have a flat-screen TV or computer monitor about that size? Think about lugging that around in your backpack. Rechargeable batteries also have a limit on the number of times that they can be recharged — usually less than 1000 times. So you will want to think about what you will do when your last battery bites the dust. All good tips and very helpful. Thanks. This is all just too depressing. I am an optimist. I only wanted to know if my magnetic mattress topper would fry my Kindle Fire I read on every night!!!! Thank you, everyone who gave me that much needed advice! I use two galvanized steel trash cans as my homemade Faraday cages. 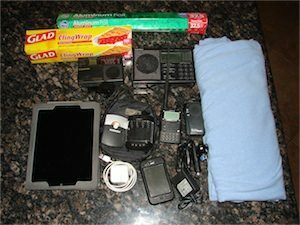 I keep two former cell phones, a former Kindle and an Android tablet in my Faraday cages, as well as a set of walkie-talkies, an emergency multi-power radio, a glucose monitor, blood pressure meter, battery-powered clock radio, I also keep several solar battery chargers and the (duplicates!) appropriate cables for each device in the Faraday cage. Every other month or so I remove the devices and update them with whatever info/documents/.pdfs/files/pictures/books I want to keep, then reseal the devices and the Faraday cages. As mentioned previously in these comments, an EMP is a momentary event… you may not even know it’s taken place until you see your “stuff” isn’t working. Once it’s determined an EMP *has* occurred, you can safely remove your electronics from the Faraday cage and get on with rebuilding your life. My house has aluminum siding and a metal roof. Am I living in a giant Faraday cage That’d be swell! While the metal siding on your house may reduce some of the EMP, it will in no way eliminate it. For all intents and purposes, you’re just as vulnerable as a house without AL siding. Simply put, there are too many openings in your house that aren’t protected where the pulse will enter. Not to mention, everything that is plugged into the wall sockets or has long wires attached (LAN cables, TV antennas, cable TV wires, stereo speaker wires, etc.) will get zapped. You’d need a lot of foil, but yes. Better would be a fine conductive mesh; likely aluminum unless you’re rich, in which case copper is better. Ever wonder why see through microwave doors have something on the inside with holes or mesh in it? It’s because the amplitude of the microwaves is too big to get through the holes. The same is true with using a conductive mesh for Faraday cages. Aluminum foil for boxes is the easiest way for you and me to do it. the whole thing with a Faraday cage, as I understand it, is to take the pulse of electricity and disperse it on a skin of metal, that will not hit the items inside. If the cage has a break in the metal skin the pulse will be channeled there by the metal skin and the full burst of energy will flash in at that point. SO unless there is aluminum all the way to the ground with no windows or doors or cracks in your giant Faraday cage it will not protect you and your items. But I have heard that you don’t need a total encolsure of metal: that ‘cages’ with holes in them can be just as safe….what about that? Are they wrong, and do you NEED something that is completely ‘airtight’? Or can you have a metal ‘grate-like’ cage with small holes to store your items? The author, Arthur T. Bradley, has tried different types of Faraday containers, as has the author of this article, Rob Hanus. And yes, read Bradley. He knows what he is doing. Why try to keep electronics when such an event would take out the power grid that would be used to run them? Better to invest in solar or wind power and stick with the old way of books and printed stuff. We would also be to busy to use electronic gadgets because we would be growing our own food and learning to make everything ourselves. Your solar and wind generation equipment needs to be protected from EMP just as much as other electronics, perhaps more so since they sound like they would be an essential part of your preparedness plan. See Rob Hanus’ reply for the first part. Books take up a lot of room. Here’s where that Kindle shines. And you’d best collect a lot of reference material on it. I’ll bet your cell phone has a lot of useful tools on it, too. The cell towers might be down, but if you protect your phone, it will be of use for some time. Store spare phone batteries or backup batteries. Think about emergency radios. You can get them with a hand crank and a USB-out, so you can keep the radio charged and charge other USB devices. If you have an Iphone or other device without the standard USB connector, get an adapter. Also beware that there are both micro and mini tips. Get the right one. I could see this garbage can solution for storing emergency radios and external hard drives. If anything near a “One Second” After scenario were to occur, our society is toast and most of us would very quickly be in very deep trouble. Utility services would cease — sewer and water systems would fail. Disease, starvation, dehydration would occur on such a mass scale there would be anarchy. One Second After was the scariest book I’ve ever read. The U.S.A. without electricity cannot sustain a population of 300,000,000 people. Very creative thinking with the digital photo frames. While EMP probably won’t have any effect on the disk platter itself, it will fry the electronics needed to operate the drive. That goes for whether it’s an external or internal drive. However, there is an issue with long term storage on hard drives that has nothing to do with EMP. Better to store your files on flash memory and make several copies. USB thumb drives are cheap and very rugged. A very good point about our society being toast. With a forecast of 90% of the US population dead in 12 – 18 years, it will be the most horrific time this country has ever seen. This is probably a good spot to clarify that I don’t advocate the storage of electronics gear because it’s going to be sunshine and lollipops after an EMP event. Books, music and pictures will be great to have and I think you should try to store that stuff, but much of the things you should think about storing are items that give you a tactical edge over those that would try to hurt you. Things like: Advanced optics like night vision, perimeter monitoring gear, communication gear (AM.FM, Shortwave and two-way radios), battery chargers, LED flashlights, repair parts for generators (wind, solar, fuel-based, hydro, vehicles), repair equipment like multimeters and welders, and so on. Bravo. Don’t forget about small solar panels. They’re becoming quite inexpensive. I must be obsessed with EMP’s. Now I’m reading 77 Days in September. Good so far, and a slightly different slant than One Second After, but still good, and still scary. Common folks. Think this thing through to it logical conclusion…there will not be radio stations broadcasting. There are some ham radio operators that have backup equipment protected so if you wish to electronicaly communicate that might be a good choice. Cell phones will be a thing of the past. Solar panels will need to be protected and all equipment you would like to hook up. Do not live in fear of living without electricity. I have lived without it and the only thing I really missed was an easy light source to light up the night to read, cook, make a trip to the outhouse. I purchased a small solar pannel. And will be using it to recharge batteries for flashlights. After they wear out the transition should be easier than at the first of an event. Warning!!! Anyone that’s shows any sign of having a power source will be attracting trouble like a moth to a flame after the grid goes down. Based on a recent email conversation I had, I think there will be radio stations that will be able to broadcast after an EMP event. Technically, you really only need 6, maybe 12, AM stations to cover the entire country. Of course, this coverage would have to come at night when AM signals travel farther. Additionally, without all the RF interference that we have to deal with now, you will be amazed at how far an AM radio station will be able to broadcast. For this very reason alone, if you stored nothing else, you should store a hand-crank powered AM radio in a small Faraday cage. Very true about “advertising” that you have power when others do not. However, there are scads of tactical considerations that you need to be aware of, for every and any survival situation. Adapt, improvise, overcome, survive. If an AM radio is what you want post-EMP, all you need is a crystal radio. (Google it.) This is a very small (about half the size of a deck of cards) electronic device and as such will need to be protected from the EMP. You can carry the device inside its Faraday box in your shirt pocket. Phase one takes out the unprotected infrastructure. Phase two is launched a couple of weeks later, after all the preppers have opened their Faraday boxes. Solar panels by themselves are not harmed by an EMP or CME. However, the charge controller will be fried. Very difficult to protect a charge controller since it’s connected to the rest of the system (can’t isolate it with Faraday shielding). So, my only option seems to be to buy an extra (500 bucks!) and store it in a Faraday can. Also, turning off your system is extremely important if you get a warning. For a CME we should get at least a day’s warning with the SOHO and STEREO sun-watching satellites. There is, however, a real conundrum in a CME: When do I turn my stuff back on? A Carrington type CME will last days, not hours or minutes. I plan to keep my generator shielded during the CME event, then after a few extra days will try that first before turning on my solar system again. They make whole house surge protectors for a few hundred dollars. Don’t know how well they protect, though. Gee. For this kind of emergency get a small foldable solar panel or three. They should fit in your Faraday Cage. What is your source for “solar panels won’t be harmed”? I have a few that I want to stash away but am wondering about storage. As for your charge controllers, you can get smaller controllers – say 30 amp without the frills – for easily under $50 on Amazon. I have a three of these el-cheapos stashed I would consider the inverter you have to be more of a need to have item than the charge controller. A good quality pure sine wave 2000 watt inverter would be much more expensive than the controller. I have several gallon sized pop-corn cans like you find at walmart at christmas. You can buy these cans on several websites new and unused. They are usually a thin steel or aluminum. The cans have tight sealing lids. I have been spraying the interiors of these cans with a rubberized spray like you see advertised on TV for gutters to act as an insulator, then placing wrapped items inside the cans and storing them away. Comments? Also, I have a large crate that I have fastened aluminum screen wire around, covering all surfaces completely. can this be considered comparable to the metal trash can? I’d also like to ask about the duration of a bomb driven EMP vs the duration of a CME EMP. Would a bomb driven EMP last as long as CME event? The various CME events that have been recorded appear to have lasted for extended periods, long enough to melt the long lines carrying electrical power and telegraph wires. With the quick burst of a nuke, would it last as long? Also, would all the type wave lengths of a CME EMP be found in a bomb driven EMP? Having read several of the fictional books, the Congressional EMP Commission Report and other reports, I am like some of you, seriously worried. I’m to old an old fart to want to have to fight for everything in my later years. Solar panels contain an electronic component that is vulnerable to EMP/CME. They will have to be protected just like any other electronic. An EMP probably won’t last anything as long as a solar flare(CME) but the atmosphere will remain charged for awhile. The initial pulse of an EMP is very fast. It has three stages. The first is a humongous spike. That’s what fries everything. There’s a second much smaller spike that might catch anything that got through the first one. What will cause all of the irreparable devastation is the third component of longer duration. It will induce immense voltage in ‘long lines;’ think power lines. When that voltage hits the transformers, it’s all over. The big transformers have to be specially built and there won’t be any electricity to power plants to rebuild them. I am just wondering how you would be able to use any sort of computer information if there was an EMP episode. The photos are a great idea. I would have them laminated though..won’t be damaged or torn etc., if they are. The problem with books though is that they are very bulky to pack and all but 1 or 2 would have to be left behind if moving around. Books on ‘how to’ would be great..ie..how to survive in the bush/what can and can’t be eaten/first aid etc. The problem also is that there would be food shortages so to even cook something would attract unwanted visitors merely by the odour of the food. Imagine hungry people getting the lovely aroma of your BBQ and just following their noses to your house!! Meal supplements are a good idea in times like that..i.e… power shakes etc., as you would be getting your sustenance and fluids without the odour attracting others. So many things to think about. Sharon, the idea behind protecting a computer, a laptop in particular, is for the information it could stored. In a widespread EMP event, the internet would be down, possibly forever, but everything on that computer, from family records to photos to stored documents, spreadsheets, etc., could come in handy. If you can store books on a Kindle, or even on the laptop, you could store hundreds of them. Actual books are very important but, like you said, they’re heavy and bulky. The energy delivered via the pulse is looking for an antenna to populate, and from there head to a sink, or ground. In the case of a simple radio, the built in antenna will absorb the energy and deliver it directly to the vulnerable electronics inside. To limit the potential harm, disconnect the antenna. Now, the pulse doesn’t know how to discriminate between antennas, power lines, ground wires, cables, etc. Any length of wire that can absorb the specific pulse will do the trick. Even edges of metal sheet can do the job for certain parts of the spectrum. A slit in your shielding can act as a slot antenna, and generate a surge within the enclosure. So, be SURE you are completely sealed. The forces the charge to develop on the outer surface of the enclosure, and prevents it from traveling around the edge of a gap to the inner surface. That trash can lid? It may fit “tightly”, but all that means is that there is enough resistance to require some effort to push it on. I gauran-darn-tee you it is NOT a seal. It is only a seal if you provide a crush gasket that will deform in such a way as to contact all of both surfaces during the seating of the lid. And such a gasket is good for only one use. Once you open it up, reposition the lid, make an adjustment… it is junk. Make a uniform band of aluminum using a long sheet of foil folded over itself with some degree of looseness. Lay it over the lip of the can, and force the lid down over it. Try it a couple times so that you can pull it off and inspect how it compresses. If it dislodges and fails to stay on the rim, you will see that and know your can /lid combo may not be suited to sealing. Try a different lid, or reshape what you have. YOU NEED A SEAL. Don’t let anyone tell you otherwise…. If it is worth protecting, it is worth protecting RIGHT. A galvanized steel trash is very effective. Using AL foil might make a better seal, but it could also leave a bigger opening if done incorrectly. Faraday cages can made from copper mesh, which has holes in it. A 100% solid barrier of metal is not required (same concept as to why you can look into your microwave oven when it’s running), but knowing what size hole is beyond the scope of this. The foil WILL stop the EMP. Nested layers of shielding is best (see my comment above about the sound analogy). The trash can, if not stopping the EMP, will greatly diminish what gets to the items inside (which are protected by foil). I don’t recommend using only the trash can for your shielding. For more protection, use more layers. EMP is a very strong pulse of electromagnetic (EM) waves. It’s not magic. It’s properties are fairly well known. The EM waves are much like what we use to broadcast AM and FM radio, only far, far stronger. Also, do not ground your Faraday cage. This will cause a lot of disconcertion among the electrical engineers, but don’t do it. The EMP also induces voltage and current into the earth. If you ground your container, you could very well be providing a direct path to the items you’re trying to protect. Is there any way to protect a large solar panel? There is some speculation on this, though. Half the ‘camp’ thinks that the panels would be fine, expect for the blocking diode, and the other half thinks that the whole panel is at risk. You could risk it and only shield some spare parts, charge controller, inverter, etc. The only way to be 100% certain that they will be functional after an EMP is to completely shield them. If you have panels that are in use, you could probably wrap them with copper or aluminum screening, but I wouldn’t know how small the “holes” in the screen would need to be. This screening would also reduce the amount of sun getting to the panels. I have a large metal cabinet with doors. If I line it with cardboard and wrap my electronics in foil and use metal tape on the doors would that work? I have 2 so I wonder if the one in the basement be better? That give a little extra protection of being underground. “One Second After ” scared me to death. I had nightmares and it pushed my prepping even more. Sometimes I see coupons for free blood sugar monitors, I’m thinking of getting some and putting them up. Put an AM radio, tuned to a strong AM station, into the cabinet and close the doors. Do the same for a strong FM station. If the radio can still pick up the signal for either, then no, the cabinets won’t be good to use. If the stations are blocked out completely, then maybe. In that case, I would probably make the cabinet a third-level of shielding. I’m curious shouldn’t you ground the trash can? I’m talking a grounding strap/cable connected to a copper stake in the actual earth? I know it counters everything that we’re taught about electricity, but no, DO NOT GROUND. This isn’t a lightning strike or like any other form of electrical event that you can compare it to. Unlike lighting or a shock from an electric wire, during EMP, the pulse is everywhere. And I mean everywhere. It will be in every pipe, wire, cable, antenna, every piece of metal AND in the earth. It will penetrate the earth and induce voltage into the earth itself. This induced voltage WILL be picked up by any metal in the ground. So, when you connect your Faraday cage to the copper water pipe, what you’re doing is giving the EMP-induced voltage a direct path to exactly where you don’t want the EMP to be. An electromagnetic pulse affects only things that are electronic — wires, cell phones, computers, a vehicle’s electronic system, our entire power grid. They do not affect the human body, although one would likely disable things like pacemakers and hearing aids. So how about making my gunsafe my faraday cage? Is a mechanical safe, and bolted to concrete walls in a basement? Then add the layers inside it. Does anyone know whether a gunsafe would make a useful faraday cage? You can use metal ammo box, although small it could hold handheld radio, crank am/fm radio, etc. Important to line the box with cardboard or foam board (from craft store). Remember: an EMP will penetrate anything that has line of sight, so if you shined a flashlight into an object, like a metal can or safe, if light would penetrate then it is not viable. Um… what’s the point of protecting electronic devices from EMPs if there’s probably not going to be any electricity to charge them, or anyone out there with the capability to put out a radio signal or what have you??? Even if there was electricity I’d be going only on the assumption that other people protected their devices. In all likelihood, there wouldn’t actually be anyone on the other end of the line when or if I could make a phone call. Not trying to be a Debby Downer, honestly. I’m just trying to see it realistically. I would probably try to protect a radio at the very least no matter what on the off chance it did help one day, but I wouldn’t get my hopes up about it. After the shock of an EMP or coronal mass ejection wears off, a world without any form of communication or incoming information is going to be nearly impossible for modern Americans to deal with. If you have even something simple like walkie talkies or a watch that can give you the time of day or an ebook loaded with hundreds of books, manuals, and other resources, all that could make a big difference in surviving, or not. Store a few small solar chargers to make sure you can utilize these tools for as long as possible. Regarding that radio — what good will that do if there are no more radio transmissions? Just asking. EMP (Electromagnetic pulse), is simply a concentration of charged particles. As such, when these charged particles encounter a conductor, they cause an electrical current to flow in the conductor (just like a lightning bolt). Unfornutantely, this current flow is usually too much for the electrical circuit to handle, and it can destroy the individual parts of an electronic device. By grounding the Faraday cage, you are providing a path for the electrical pulse to energize, and flow AROUND the electronic devices contained within, thus providing protection, since electricity ALWAYS follows the path of least resistance. Since any electrical charge would immediately dissipate to ground in a properly constructed and grounded Faraday cage, there would be no harm to anything contained inside, even if it was in contact with the Faraday cage. The cage is simply a tool to provide the path of LEAST resistance to an electrical charge (in this case, EMP). A lightning rod works in exactly the same manner as a Faraday cage, and also must be properly grounded to work correctly. It provides the least-resistant path for the electricity to flow to ground, and thus dissipate safely. On a technical note, an ungrounded Faraday cage will act more as a capacitor (electrical storage device) than anything, which can indeed cause damage to any sensitive electrical components within, since the electrical current is searching for the path of least resistance, and may end up going through your electrical items within the cage. This may also cause capacitive and magnetic induction which can cause damage to unprotected electrical circuits (induction works similar to EMP, but in this case would be on a much smaller scale). This phenomena is also known as ‘ground loop’. Summary: Ground your Faraday cages properly for the best protection. Please take some time to learn basic electrical theory. Electric current ALWAYS seeks and flows to GROUND. Period. It WILL NOT flow ‘backwards’ into your electrical components, simply because it seeks homeostasis, like all things in nature. Your ideas about not grounding Faraday cages go against known LAWS of electricity and chemistry. No matter whether you have a positive ground, or negative ground, electric currents will ALWAYS flow to ground when given the opportunity, no exceptions. That’s not the opinion of the EMP experts and scientists. Large Faraday cages for EMP can be grounded (if you know what you’re doing), but small ones, like those you would use at home, should not be. Yes, it goes against what we’re taught about electricity, but if you look into what EMP is, as well as what the EMP experts are saying, you’ll see that grounding EMP Faraday cages is not necessary and may in fact be the exact wrong thing to do. I don’t mean to be rude when I say this, but you really need to do some research before you start telling people about something you don’t know anything about. It’s dangerous and irresponsible. 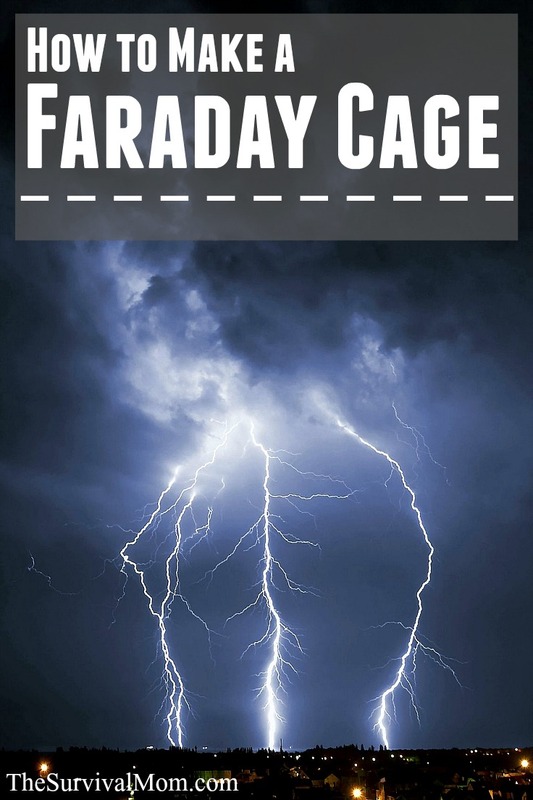 A Faraday cage is named after–guess who–a guy named Michael. He discovered that the charge from an electrical pulse remains on the OUTSIDE of a closed container. That’s why it works. To ground or not is debated, but yes, for small cages, NOT grounding makes sense. Check what Arthur Bradly thinks this week. Thanks for the article. This issue of EMP events needs to be made an issue regularly. People need to know how bad it will be if the grid goes down even in a relatively small region. This should be common knowledge but it is not. Families need to prepare accordingly. They need to be able to make informed decisions. How bad will it be? Thanks for this article. We were wondering about “testing” our small “popcorn” tin Faraday Cages”. My husband suggested using his cell phone. We placed the cell phone in various cans we had around the house. We put it into the can and then tried to call it from our home phone. If it rang inside the can, we concluded that it wasn’t a good cage. We did find many cans that did serve as FC’s. We have tried the larger metal “trash can” type and it didn’t work as a cage for the phone. Perhaps the one we put it in was made of a different type metal. Based on your article we will keep trying. Also, the small “popcorn” tin Faraday Cages have not been grounded–yet. There are some very fundamental errors in much of what is being said about EMP and Faraday Cages. My best advice would be to purchase the book “Electromagnetic Compatibility Engineering” by Henry Ott. Pay particular attention to the descriptions of how metal enclosures attenuate RF signals and how holes and gaps render an enclosure ineffective. To be an effective Faraday cage the trash can lid must be fastened to the can at intervals of 1/20th of the wavelength you want to be effective down to. Each fastener has to compress the layers of metal together at 100 PSI. Then you will find that the thickness of the trash can itself will only shield RF above a certain frequency. The book will explain why you do not want to ground your Faraday cage. The book retails for close to $200, but Amazon usually has some new for $140. I lucked out and obtained a used one for $80.00. For interesting reading on EMP testing Google “Operation Starfish Prime” and “Operation Baker.” It’s darn hard to find, but search for articles on Soviet Testing of EMP. There is no way I have the time to condense the book into specifics to argue against the errors in these posts. I bought the book because I was designing a piece of electronic communications equipment for the Air Force and it had to undergo certain tests. I was wondering the reason the Faraday cages were not grounded? When an electric charge hits the outside of the Faraday cage the electrons will attempt to become uniform on the outside of the cage, without a ground to make the inside of the cage neutral, wouldn’t the electrons flow to the inside of the cage until the external charge became uniform across the entire conductor? Furthermore if you only grounded the outer layer of the Faraday cage would that be enough? Should all layers be grounded independently of each other or would grounding the inner layers be worse rather than better? I am asking not just as EMP shielding but as if I were sending the entire electromagnetic spectrum at it with several million volts, or for instance if I put an electromagnet on the outside, the foil and trashcan are non-ferrous but would the contents still be attracted to the magnet? See a comment above, but they don’t. That was discovered by a guy named Michael Faraday. All the negatively charged electrons stay on the outside if its closed or made from a fine conductive mesh. Two things…. First, I just popped over to Amazon, checked out the synopsis, and purchased the Kindle version of One Second After. I love a good book. Second, I’ve gathered a collection of both physical and electronic information. I built the above cage and placed a solar charging weather radio that has USB and assorted tips for charging electronics. The radio charges by hand crank if no sun. I also placed 3, 32 GB, ipod touch 4’s with ALL my family photos, all our personal information (id, income tax, , drivers license copies, birth certificate copies, etc). I did this with 3 because I have two daughters, each with a family of their own. My kids don’t do the prepping thing, but I do for them. One for each of us, EXACT same information, medical, food prep, water prep, shelter, and 3 Scooby episodes and two Disney movies for the grandkids (I never forget the grandkids when I’m prepping!). Once a month or so, I get them all out and update with the new information I’ve found and put them back. The girls know they have their own “BOB” sitting at my house, if they can get to it. Would any narrow gaps in shielding be susceptible to arcing sparks leading to a fire hazard? the tin foil would work great but only if the device is insulated from the foil. otherwise the foil will actually enhance the emp and make it more destructive. also any wires left attatched to the device and unprotected will do the same thing. The comment up there made me wonder – would an old microwave oven work for this purpose? Anyone know? I have made a faraday cage out of a trash can. When I put a ham radio in the can it will still recieve signals. If I put it in an unlined pop corn can, it will not revive signals. What am I doing wrong with the trash can. I have it lined with card board. Another thought, what about putting the pop corn can inside the trash can? Make sure that there are no gaps in BOTH the metal outside and the non-conductive lining inside. How about everyone taking good old fashioned Girl or Boy scout classes. Advil? Learn which plants will treat ailments. We need technology to function as a business society, but could survive without it if we are prepared. Not everyone could. And we would need more than just knowing about medicinal plants and knowing knots and camping techniques. Think about it. What plant can produce proper insulin for a diabetic, or a cure for pneumonia? How would we grow food enough to survive? What if this event happens when you are away from home, in an unfamiliar region? Many people died in the olden days of the technological life we would be living, and they had an entire lifetime of experience. 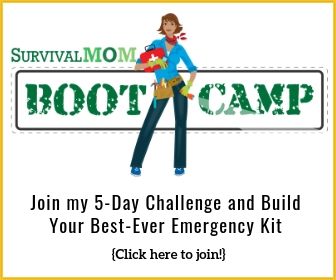 Even with training and planning, survival would be anything but certain. Since I have the capability to store fuels and lubricants, I would like to consider ways to protect some of my vehicles so I could get around after an EMP event. Any suggestions? If you vehicles are new, you’d have to keep spare parts for any of the electronics in the Faraday cage. You could make a giant Faraday cage from a lot of cardboard lining and metal sealing of any cracks. Cars built without any of these electronics, will still function. Probably early to mid eighties and earlier. Look for a vehicle with plugs, points, and a distributor. I bought a solar humless generator w 100 watt solar panels for charging it. It was shipped in a heavy cardboard box w heavy copper staples and 1/2inch styrofoam pieces as package materials. Can I use the cardboard box it came in as a faraday box if wrap the outside with several layers of heavy duty foil and do the inside also? Are the copper/copper colored staples a concern and does it make a difference what side if the foil, shinney or dull, faces towards the inside of the box? The generator is also inside a heavy thickness plastic clear bag. Do I leave the bag on and wrap it in foil as extra precaution? What/how do you suggest prepping my generator from what I have told you? I have not taken the solar panels out of their box yet but will faraday them also. These will be my creature comforts wtshtf. Your input appreciated as I have to get this right the first time without error. Thank you and regards. Trash the staples and tape it together with heavy tape. Wrap the box in heavy aluminum foil. This is one layer of Faraday protection. Inside the box, put another aluminum foil wrapped box; etc. The innermost layer MUST be a NON-CONDUCTOR. Make sure each layer is patent; that is, completely sealed. I think all the talk of an emp is now futile. With our borders being dropped by the current POS in the whitehouse this country will succumb to disease long before an EMP could do us harm. My advice buy visqueen and lots of n95 masks, along with germicidal soap. You will need them to quarantine yourself inside your house. Also be prepared to shoot anybody who tries to force you out of said house. Lots of air filters as well for the furnace. Hi TheSurvivalMom, thanks for sharing this DIY faraday shielding device. I’ve always wanted to make my own and I’m really interested about faraday shielding. Yes, if you line it with cardboard or other insulator make sure you tape the cardboard lining with non-conductive tape and the outside of the box with a conductive metal tape. Does anyone have experience combining a fireproof box with a Faraday cage? Are fireproof boxes already lined with metal inside? I am currently looking for a good deal on a tablet to download lots of books, movies, data and pics onto, but if I EMP proof it and there is a fire I would be sad I didn’t fireproof it. A good gun case is fire proof up to 1200 degrees for 60 minutes. this will hold about 30 types of guns. you can faraday it after you get. BUT, this type of safe will run about 1200 to 1500 dollars. I have a LIBERTY safe that I just described and I was thinking of the Faraday thing for it. Will military Ammo cans work as cages? Would a large commercial fireproof safe work instead of the trash can? I think it has cement lined walls. Have always wondered, what about the magnetic field that is 90 degrees to every athletic field? All of the faraday cages that I see only address the electric field and not the magnetic. Do you need magnetic shielding? Want a perfect Faraday cage? get an old, intact, unworkable microwave, its already a Faraday cage. Or your current one, either or. Don’t want to be GPS tracked ? Same appliance will do that to. If you have an old inoperable one, store your emergency electronics in it, safe as a bank vault. Thank you for the great information. Ever since I read One Aecond After, I have been trying to get something set up. I have ordered the trash can, and foil from Amazon. One Second After was even more terrifying to me, as I live in Asheville, NC. (The large town closest to Black Mountain) when you know every location being described in the book, it slams home like a Mack truck. He even described walking right past a store owned by my family! I have a small solar generator, and a spare CPAP machine for my sleep apnea that really need this protection! Thank you again for your help with this project. Will dvd’s or cd’s work after a emp. Or will they need to be wraped to. CDs and DVD are immune to EMP. They are non-magnetic. Hard Drives, Flash Drives and SD cards are magnetic and will have to be protected. It is the devices that access the data stored that are most vulnerable. I have read several reports on this over the years. As technology changes so does the data storage. Read through the ZD Net link. I agree with the formats recommended for your data. The more common the file the more likely it will be read by future devices. For documents: Text files ( Notepad is still around! ) or pdf. Text and diagrams can both be done in pdf. Hard drive storage is much cheaper and CD/DVD are too. I would recommend BOTH. CD/DVD and magnetic media. If storage space is a concern then SD cards are much cheaper now. It’s hard to beat a 1TB drive for well under $100 now. I’ve got several NEW 80-120 GB drives laying around. I’ve received rebates on CD’s so they were almost free. That takes a while to burn each one, but you can separate files easier that way. One other option (as a back up only) is letting someone else store your data. You can encrypt it before uploading if you choose to. Right now keeping it on hard drives is my option. Burning to CD/DVDs will be done ……eventually. Can you line the aluminum can and the lid with that foam that expands and then put foil wrapped items inside instead of using a cardboard box? 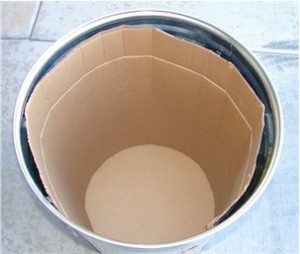 Cardboard isn’t some sort of magic solution, it’s just an easy way to line a metal container with something that is non-conductive and easy to acquire. Regarding that foam, my guess is that yes, it would be effective but looking at the container sizes, it would take quite a bit to completely cover the inside of the can and the lid. It covers what you need to protect, how to protect and information on many presumed things like cars (they are protected). You don’t have to layer protect, you don’t even need a trash can.. you can use a cardboard box with aluminum foil around it. Just keep it dry. I’ve done quite a bit of research this year on the subject of EMP. I was shocked to learn that the government vehicle test results were based on only partially completed tests. Vehicles from the DOD were on loan and the researchers were told that the vehicles had to be in running condition when returned. As soon as the vehicles began showing signs of EMP damage, the test ended! It’s very possible that other, more conclusive tests, have been conducted but those results haven’t been made public. As far as cars being Faraday cages and thus impervious to EMP, if you think about it, you can use a cell phone inside a car just fine! It’s true, vehicles are a Faraday cage, but the term, “Faraday Cage,” is a very general term to mean a shielding of EM energy. Too many people think that a “Faraday Cage” means it protects from everything. It doesn’t. The fact that you can use your cellphone from inside your car illustrates it’s not a perfect block of EM energy. Your microwave oven is a Faraday cage, but only at those frequencies at which the microwave operates (about 2.4 GHz). There is a lot of metal in the frame and body which acts to block some RF, and because car manufacturers don’t want to be sued when their cars shut down when passing radio stations, the computers are well shielded (electrically). You would be amazed at how much RF (radio frequency) energy is passing through the air at any given time. There are many AM radio antennas along interstates and roads, putting out about 50,000 watts during the day (some are less, and there are at least 4 that crank out 100KW). If cars weren’t well-shielded, their computers would crash from all the RF. However, is this shielding enough to protect them from EMP? No one seems to have a definitive answer. I’m sure someone in the federal government knows, as they have the ability to test everything in their EMP simulators, but it seems to be classified information. A car doesn’t work as a Faraday cage because they have windows and other openings for the voltage spike to get in. I read “One Second After” too and reality slapped me hard. Needless to say, we’re prepared and the Faraday Cage is the last thing on my list. Thanks for making it so easy & God bless! Make a list of what you put in each can. Wrap trash lid with aluminum tape to completely seal can. More small cans is easier to manage than one huge can. Load old tablet with maps, pictures, gardening books. Whatever else you need to read; add walkie talkies (or ham radio) Add a little solar recharging kit and you are way ahead of the game. It is east to get carried away once you get started, which is why you need a paper list. Can you make a portable Faraday cage so that you could carry walkie-talkies and batteries in your everyday bag? I’m thinking about how to contact my kids after an EMP. They carry backpacks with supplies to get home. Could we each have a foil wrapped walkie-talkie inside a small tin? Thoughts? A walkie-talkie is small enough that it could be protected inside a portable Faraday box or better still a bag. My primary concern here would be the durability of the container. If a bag gets ripped or small tin’s lid gets popped open by your kid throwing a school book into his backpack on top of the Faraday container, then it is no longer protected. You will want multiple layers, alternating foil with tough fabric, with the outer-most and inner-most layers being the tough fabric. For the fabric, think about the material of the backpack itself. If it is tough enough to survive your kid’s abuse, so will a Faraday bag inside the backpack that uses the same material layered inside, outside and between the foil layers. Since you will not want to be disturbing the foil frequently to recharge batteries, I would use non-rechargable AA or AAA batteries with a shelf life of 5 to 10 years, inside their own separate Faraday bag. However, you may be better off to arrange at least two meeting places near the school, such that one is primary and the other is in case the first is not usable. Of course the school itself is the first place you will look for your kid, and then move on to the others by their pre-arranged priorities. Remember that both you and your kid will likely be on foot as your car and the school bus will be out of commission. The problem with walkie talkies is their range. You will see walkie talkies on the shelf at Wal-Mart or hardware stores that advertise “36 mile range”, but what they don’t tell you is that 36 miles is line of sight. So, if you have a couple of hills or several tall buildings between you and the person you’re trying to contact, you are sadly n oh t going to be successful. I have a SentrySafe for all my valuables.It’s thick and heavy and is water and fire resistant. Would something like that be able to protect electronics devices as well. I assume a safe is fairly well insulated with metal to keep an EMP out. Any comments? Ms. Marion is correct, no matter how “tight” the seal around the can lid seems to be, taping the can shut with a conductive tape will reduce leakage. I saw a comparison of expensive copper conductive tape vs. aluminum foil tape. I wish I had time today to hunt up the link to the video which I saw, but I do not. As I recall, the researcher was very surprised at how little difference there was between the two! If I remember correctly, he had not been sure whether or not the “cheaper tape” would keep out the leakage. Since you need to re-seal the container after each time you open it, he said that he was definitely going to keep on-hand some of the cheaper aluminum tape, as the hard-to-get copper variety made for this purpose is considerably more expensive. The rolls I got look a lot like regular “duct tape” which you can find in normal hardware stores. Except this is marked “metal repair”, “foil tape”, for “metal duct work”. You want to make sure that you use one that is actually aluminum foil, not silver-colored plastic! 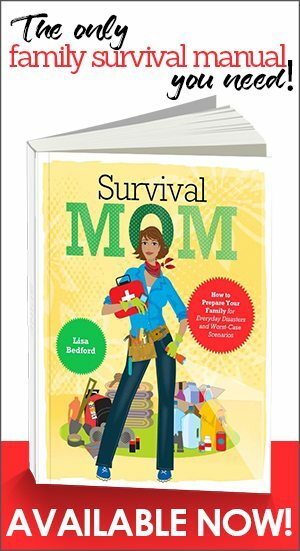 I am so glad that I found the survival mom site. Lots of good information here. I have already foil-wrapped and boxed my radio, and then foil-wrapped again. There are rags wrapped around the items, then the 3 layers of foil, then another rag around that and then that put in a box and then 3 layers of foil. I plan to put these in an insulated steel garbage can. My question is: do I need the plastic bags around electronics? I didn’t do that step. How do I protect a digital electronic lock on my gun safe? Thanks for any suggestions, Philip…..
I’ve never seen an answer to my question. I’ve wrapped my weather radios and other important items in cloth, then plastic, then three layers of foil as directed. Then put them in small foil wrapped boxes sealed with aluminum tape. Then I put these in the large aluminum garbage can, lined with cardboard and sealed it with aluminum tape. My question is this: Is it okay for the five foil-wrapped boxes to touch each other in the can? Or does everything have to be not touching in the can. If each item is wrapped and securely sealed, it will be fine for them to touch each other, but if you’d like another layer of protection, trace the lid of the trash can on to a large piece of cardboard, cut out the circle just within the drawn lines, and you’ll have a cardboard partition between layers of electronics. Remember that our enemies can read these posts too. Nothing says that they won’t do a 2nd EMP a couple of weeks after the first, then our protected items get destroyed since we unwrapped them for our use..
Great idea (cardboard partitions) thanks!! What about a pressure cooker with vent holes taped? Have a query. I have many styrofoam coolers used by Omaha Steaks for shipping. They are sturdy and thick, seal very well, and are non-conductive. Could these be used as Faraday cages as is or are modifications; aluminum foil wrap, etc. necessary? You need the patent external aluminum foil wrap. Non-conductive does you no good. A Faraday cage works because it conducts electricity around the items inside. That’s why the items inside must be electrically insulated from the cage itself. If you took a cardboard box and wrapped it in 3 layers of aluminum foil with a tight lid, would that work for a laptop, battery radio, a battery operated watch ?? Any thoughts as to the possibilities of making a 4′ x 6′ enclosed utility trailer into a successful faraday cage? And if so, how would one go about doing this and how much money are we talking? Thank You!! I built one with the same enclosure but used spray rubber for the no conductive layers and aluminum foil, heavy duty, and aluminum screen mesh for the conductive layers. I have 5 separate conductive and nonconductive layers. I joined the seems of aluminum foil and mesh with copper tape that had a conductive adhesive. Looks cool and hardy after last layer. The challenge was where the lid and top of steel can meet ensuring each layers connects with no gaps. Most of us already have a Faraday cage in our homes- a microwave oven. Microwave ovens are completely sealed against electromagnetic-radiation leakage (the microwaves), so if a microwave oven can keep electromagnetic-radiation in, it should also be able to keep it OUT. Just get a couple old (even non-working) microwave ovens and put your survival electronics in there. I keep one in the back of my truck too. Nope, unless you get rid of the cord and layer the holes. i hope you get this because i was wondering if you can make a farada cage out of one of the foam ice chests if you can can you please tell me how! please thank you.. I also read “One Second After” and it scared me. I live in a suburban area near the coast (about 10 miles) and we worry about flooding. We are also close to a major Air Force Base (about 20 miles away) and the thought of nukes cross our minds as well. Anyway, last night we had minor communication disruption (cell, cable) because of a Coronal Mass Ejection at G3 level. Today, I put a SW-AM-FM radio and a smaller emergency radio (the kind with a crank and solar) that can also charge smaller devices (but it can also power the SW radio in short durations. I believe this is a small precaution as prep for the next event. I’ll leave it in the drum unless the next problem knocks out power for more than a day, then we can pop it and try to find out what’s going on. I would be very concerned about a second emp. Enemies have to knkw some of us are prepping. If they want to really hurt js they will do a second emp after all of us have brought out our protected stuff. Yikes! Do you think whoever attacks us with a nuke is really going to be around to do it twice…just asking. A few years ago I would have asked that same question. Now? I’m not so sure what the answer would be. SO-O-O much good and interesting information. But I have an un-addressed issue: I have an oxygen concentrator (it is a machine that “creates” oxygen here at home so one is not “attached” to oxygen bottles — but still keeps you attached to your oxygen tube, of course). It runs 24 hours a day. I also must use a C-PAP at night. Is there anything I can do to protect these pieces of equipment??? Especially the oxygen concentrator — it costs several thousand dollars, so replacing it is not in the picture, but neither is living without it!! Any suggestions? Thanks so much – and keep up the good work! Not unless you can put yourself and the oxygen generator in a big Faraday cage. You’d need to power the generator from large batteries and keep some bottled oxygen on hand. Sorry, but I just can’t think of a realistic solution. SO much great information and help. But I have a different situation. I am on oxygen 24-7 for which I use an oxygen concentrator. They cost several thousand dollars – so getting an “extra” is out of the question. Is there anything I can do to “protect” mine? I have the same situation with my CPAP machine, but I’m planning on getting a new one and using my old one as a spare in the faraday cage. Any suggestions would be most welcome. Thanks in advance. I too was wondering about the electronic locks on safes…might be a good idea to purchase a spare, load it with your code, and put that in the cage or bag…your going to need your weapons much more than a weather radio…..or i pod! I would assume that your gun safe is proof against tampering such as removal and replacement of the electronic locking mechanism, so your spare lock in your Faraday box will not help you to open your gun safe when the electronic lock is fried. Better build a Faraday box around your gun safe which is not dependent on fragile materials such as foil, so that you can open and close it as needed. At this point I believe you can buy such Faraday boxes about the size of a refrigerator. Or use a gun safe with a mechanical (non-electronic) lock. I had no idea that a Faraday cage could be constructed so easily. Thanks. I have a few brand-new, still in the box, electronic devices that I would like to leave in their boxes (laptop, DVD player). Can this be done? This feels like fear-mongering for personal (financial) benefit. If there is an EMP detonated in every major city in the world, what good are your iPhones and Kindles going to do? Are all the books in the world going to crash? Will simple electronics like CD players be fried beyond repair? Or will you just be the hottest thing on the block with a pair of earbuds and a solar charger. So unless you’re gonna fit an ‘Advil factory’ into that garbage can so you can have that Advil which saved so many lives in the 1800s when their hands got sore from weaving, maybe just go buy books about farming and spinning (wool, not burning off ‘carbs’) and weaving? But that doesn’t sell books or drive website ‘hits’, does it? Joshua, I have addressed that issue again and again on this site. Think of how you use those devices for storage. I have hundreds of books on Kindle, tons of survival/homesteading books saved to my smartphone and laptop, etc. Walkie talkies or a ham radio that has been protected could provide forms of communication when everything else is down. All these and many more would give you a huge survival advantage. I have read in each and everyones postings….The best and only way for “SURE” is a ham radio, this way if you have families, make sure they have one so you can commuicate. They are reliable and you can keep in contact with other ham operaters thru out the US and other countries to keep in touch of whats going on around the world. What if you ran out of batteries for walkie-talkies. There isn’t any electric to charge the cell phones up. If your using gasoline for generators it will be rationed or there may not be any. I,m old (76) and I’ve seen a lot of this wicked world, thank God I’m in good health. I wouldn’t put anything past the Central Bankers, the elites and the globlist. They control!!!!! The president is just their puppet and how HARD Trump is trying to change things…he will meet up with obstacles, you can bet on it. You still have to be able to power the ham radio, even if you protect it. An EMP is a real threat, especially with ISIS and N. Korea willing to do it. Don’t worry. If it happens, the bankers will be out of business. As for batteries, you need solar panels with a USB-out, a USB charger (NOT the kind you plug into the wall), and rechargeable batteries. Have a lot of the latter, because a rechargeable batter can only be recharged so many times. I have said it before in reply to others’ comments, but I think it is worth saying again. What ever batteries you put into your Faraday bag/box/cage will need to be left alone until needed because you will not want to be disturbing the foil frequently just to recharge batteries. And you will want to have power right away, not after you have time to recharge some rechargeables. However, you can get at most big-box stores a package of 50 to 100 AA alkaline batteries with a 5 to 10 year shelf life. Even Amazon sells them but the package I saw on their web page does not show the shelf life. So do get yourself a batch of long shelf life batteries and set yourself a reminder to replace them a couple of months before the end of the shelf life in 5 or 10 years from now. You can also have a batch of rechargeable batteries and a hand-crank/solar charger for them in your Faraday box. What is the risk of fire when all the wiring in one’s house is fried? In place of cardboard? Has the same physical characteristics, but would withstand dampness better. It’s not free, but not real expensive either. Here’s a quick test of your Faraday cage. Place a cell phone in the cage, then call that number. If the phone rings, then your cage is a failure. If it doesn’t, then, maybe, it will work in a real EMP event. No one knows for sure. It’s never been done. One source of information you might enjoy is Dr. Arthur T. Bradley’s book about EMP and his videos on YouTube. He’s a NASA scientist, an electrical engineer, and has done quite a bit of testing of things like microwaves as Faraday containers. Get two garbage cans. A large galvanized one and a slightly smaller plastic one that will fit inside. You may have to cut the plastic handles off to fit, but then you have it. I have a dumb question for all of you. Would it increase the effectiveness of you go device, cloth, plastic wrap, rubber glove and then the aluminum foil? And perhaps another rubber glove on the outside? Thank you in advance for any answers I get and of course this is for a small device, nothing large. What would Insulin dependent diabetic do when can’t get extra insulin to store? That is a tough situation. Some people are buying extra insulin to stockpile — not years’ worth but certainly for many months. Insulin does degrade a bit over time but is still effective past its expiration date. Have you read these 2 articles written by a mom with a Type 1 diabetes child? I am new to all this stuff and have a question. If there is an EMP attack, the grid won’t work anyway and cell towers etc won’t work so why do we need to put our cell phones in a box for protection? Aren’t they useless anyway? I actually built the one pictured a few months ago, now to just make sure to put ALL the stuff in it…I’m thinking an mp3 player with all kinds of music, alt powered radio, maybe an old notebook w thumb drives holding all our “GNG” info. (I already have this stuff on a drive, just need a duplicate in the can) and another with pics.